Roadshow Films has announced that Joss Whedon’s “Cabin in the Woods” will not be getting a full cinema release anymore. But fans in Melbourne and Sydney will still have the chance to see it in a limited release. According to this update from Roadshow Films, it will screen at Cinema Nova (Melbourne) and Chauvel Cinema (Sydney) from June 14. Cabin in the Woods (CITW) provides a new twist on the classic young-people-stranded-in-the-woods horror trope, when a group of college kids spend a weekend at a mysterious cabin in the woods. The film features Australian actor Chris Hemsworth (currently riding high on the success of The Avengers) and NZ actress Anna Hutchison as well as the Whedonverse’s Amy Acker and Fran Kranz. Roadshow previously announced that CITW would be released in cinemas on 21 July 2012 (some 3 months after the US release), but then announced that fans will have to rely on an (as-yet-not-announced) DVD release. 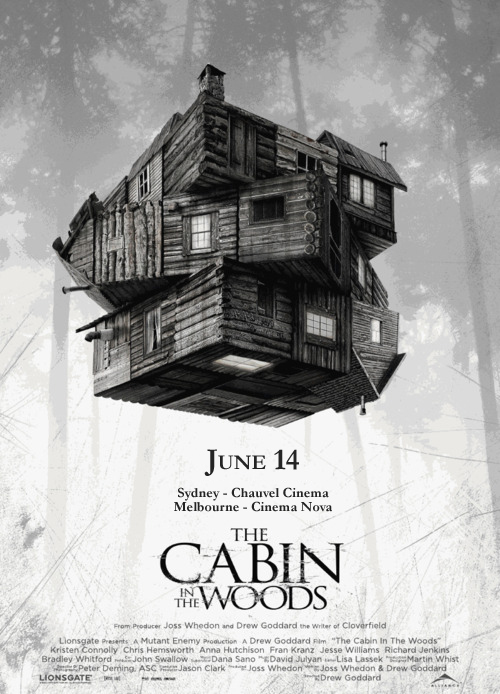 We’re very sorry to confirm that Cabin In The Woods will not be getting an Australian cinema release. Many of you have been asking for reconsideration, but unfortunately CITW won’t be released in Australian cinemas, and will be released straight to DVD instead. We know that this confirmation is disappointing news, but hopefully this means you’ll be able to see it on DVD sooner than originally scheduled. Fans and critics expressed their disappointment on Roadshow’s Tumbler, Facebook and Twitter, and Roadshow have listened to the pleas and granted a limited release – but only in Melbourne and Sydney. Your response has been overwhelming. We’ve been listening since the beginning, but wanted to wait until we could confirm the good news before updating you. We are pleased to announce that you will have the opportunity to see the film on the big screen! Cabin will playing from June 14th in Sydney and Melbourne for a limited season at these venues: Sydney – Chauvel Cinema; Melbourne – Cinema Nova. We genuinely appreciate all of your posts and comments, and we have been working hard behind the scenes to try and secure these dates. Thank you for being so passionate about The Cabin In The Woods. We hope you enjoy watching the film on the big screen!